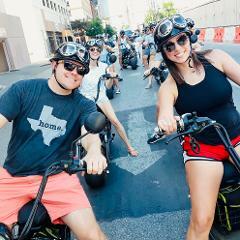 See the sights of San Antonio and have a blast on our guided electric minibike tour! San Antonio is more than just the Alamo or the Riverwalk. Let our guides show you the best of the city! Our fat-tire minibikes are fun and super easy to ride. We believe that riding is more enjoyable with others, so bring a friend as each minibike seats TWO! We keep our tours exciting and unique which means no two rides are the same! Our Road Captains will make sure you get to see some of the best points of interest in San Antonio such as the Alamo, the Tower of the Americas, the San Fernando Cathedral, and much more! 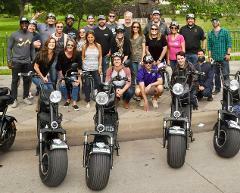 No tour covers the best of San Antonio or is as much fun the way Your Biker Gang does! Be sure to bring your smartphone or camera to capture all the memories! Our Road Captains will customize a tour of San Antonio for your group. From the Alamo to the Tower of the Americas, let us know what you would like to see! Our road captains will work with you to give your group a tour they will never forget! Want to depart from your hotel and end at a restaurant? We can do that! Let's talk and plan your ride!